I'm pretty curious about twins. Especially identical twins. Especially identical twin girls. From Ruth & Raquel in the Brazilian drama series - Secrets of the Sand, I wondered how two people who looked exactly alike were yet so different (I obviously now realise both characters were played by the same person). From TV to real life, I think I may have met my first identical set of twins while in high school - couldn't tell them apart. They seeemed incredibly close and rumour had it that they shared one phone & one email address. So I wonder about seemingly mundane things like the twins' names and pranks they played. And I know I'm not alone. Just this morning while scrolling through Instagram, someone posted that it was her twins' - Chris & Chris 3rd birthday. A lady politely asked if she called them Chris 1 and Chris 2, to which she responded that they were actually Christian & Christopher. Cool huh? But this is all from third party perspective. How do twins themselves feel? Are they really psychic? Do they often get compared? Are they best friends? I decided to stop wondering and just find out! I'll be sharing the responses of select twins - identical & fraternal on alternate Tuesdays this October & November. Let's call it #TwinTuesday shall we? Kicking off with Adaugo and Ugonna today! They've just turned 21, and live in Lagos, Nigeria. While Adaugo is a law graduate who enjoys reading, Ugonna chose to go the Accounting route. She enjoys dancing, but her twin thinks she's a terrible dancer! They share their experiences with us today on a lot of things you've always wondered about. A: Our names are not names typically given to twins. I personally think it’s perfect and it would have been a little cliché if we were given similar names or names meant just for twins. We are usually called ‘ibeji’ or ‘ejima’. Some people even go as far as calling us ‘Taiwo’ and ‘Kehinde’* although we are not from the western part of Nigeria. But what can we do? U: Growing up, we were always referred to as ‘ibeji’ or ‘ejima' and till today, many people still don’t call us our individual names. I would have actually preferred similar names like Adaugo and maybe Adanna. A: We grew up pretty much doing everything together. We went to the same schools until university when we decided to go our separate ways. Growing up together was pretty fun, we often got dressed alike, and had matching items which always caused a huge problem because we couldn’t tell who owned what. We also got compared a lot from "who is prettier? ", "who is more gentle? ", to who was better at something - even if most of the time we personally didn’t see any difference in which of us performed a task or activity better. I am pretty sure people had their favorite but for the fear of making the other person feel bad, they probably never voiced it out. U: Growing up we were always dressed alike and I would say that was one hard part of being a twin because once an item got missing we'd start arguing about who owned the available item - which was pretty frustrating. I don't think we really got compared growing up, but lately people tend to start making unnecessary comparison as to who is prettier, taller, slimmer, friendlier and so on. A: It’s really just a myth - there are no special powers to tell whether my sister feels good or otherwise. However I believe that I sometimes feel my sister's pain (can’t say the same for her). If she tells me about something bad that happened to her and she starts to cry, I will most definitely join in the tears. I remember once when a guy broke her heart and she called me crying late at night. I cried myself to sleep after consoling her - although my own heart was still intact. U: To be honest, I think those are just myths. People fail to realize that we are normal human beings just as singletons. I can’t tell when she isn’t feeling alright if she’s not by my side or if she doesn’t tell me herself. People often say that once one twin is sick somewhere, the other twin will definitely fall ill - that doesn't apply to us. A: We share a room and everything in the four walls of the room. From clothes to shoes and makeup - well except under garments. U: Yes, we do share a lot of things. Once I purchase anything, I know I’m purchasing for my twin and I. We basically share everything except for underwear. We have separate emails and we also we don’t share accounts or anything relating to social media. U: Back in secondary school, we always used to confuse people especially when one of us is given something to hold that needs to be given back, we both start pointing at each other and most times people get frustrated (it wasn’t an act of wickedness, was just for fun!). Sometimes people who are really close to us can actually tell the difference. Funny but true, our dad didn’t really know the difference until recently. A: I’m personally indifferent about getting married to a twin. I wouldn’t mind having twins but would prefer twins of different sexes only because that relieves the stress of giving birth to two children at different times. U: I personally would not like to give birth to twins. I feel like I cannot deal with two babies at once. And I always get this belief that once you are a twin, then you most certainly won’t have twins of your own. Marrying twins will be cute and cool as long as I can get to tell them apart - I wouldn’t want to get mistaken and take my sister’s husband one day! A: My sister and I are the best of friends. Sometimes I forget we are sisters let alone twins. When I’m trying to get out of an awkward situation she’s the one I’d rather call. When there’s a sale I’d tell her first. I don’t have other best friends because we pretty much grew up really close and she is all the friend I need. U: My twin is my best friend. We don’t have to be best friends because we are twins but she is. She’s basically all the girl squad I need. Although I have another close friend but it doesn’t compare to the relationship I have with my sister. A: I personally think that people do not appreciate our individuality. We are twins but we are not the same people. We are almost - if not totally opposite in character, lifestyle and other things. People often compare us every time. To be honest we totally understand and we just let it go, but between us we both know each others' strengths and weaknesses. We know that sometimes one person is better at something than the other. U: People definitely compare my twin and I. We live in a society where people feel because we are twins we can’t be different in terms of attitudes of interests or any other stuff. People need to understand that as much as we were born together, we are still individuals and we should never be compared in terms of our achievements. That’s the hard part of being a twin, but we never really pay attention to those who compare us openly. The best part of being a twin to me is looking at my sister and feeling like I’m staring at a mirror, it’s so amazing to be honest! I'll have to agree with Ugonna on that last line - it must be really amazing having someone look like you! I found it interesting how although they provided separate responses, there were strikingly similar. For example, on the pranks they played, their dad being unable to tell them apart and losing an item of clothing. Yet, you can see how different they are. Adaugo would love to have twins, Ugonna doesn't think she can handle it! Adaugo loves the non-similar names, Ugonna would have preferred something more similar! What's your experience with identical twins. Are you a friend to one? Got twins as kids? Married to or a sibling to one? I'd love to hear all your stories, so do share. 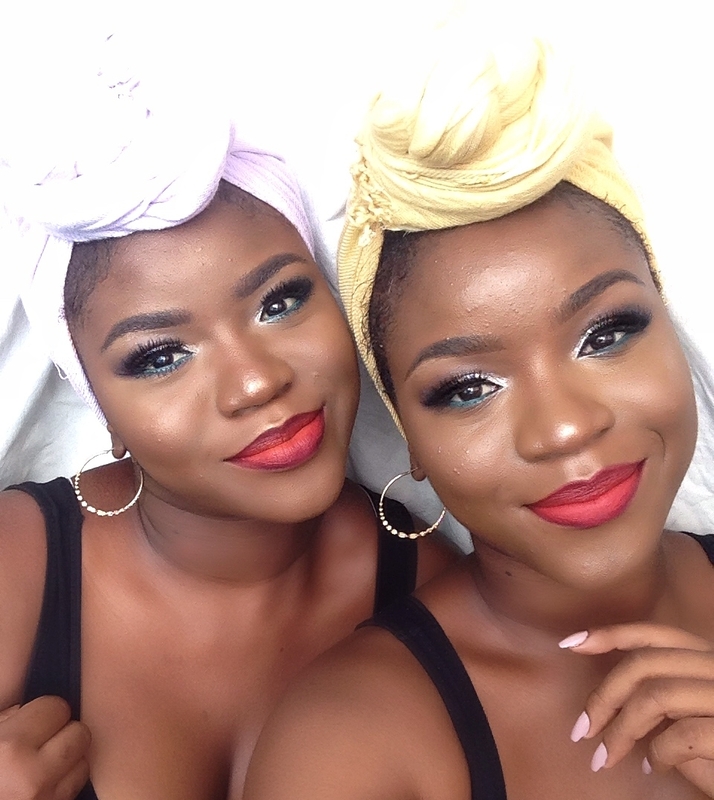 pS: Taiwo & Kehinde are popular names given to twins from the western part of Nigeria. And in our next feature, we've got a Taiwo & Kehinde, so come back for all the juice! To Couple Twin or Not?